I swapped seeds for a packet of Inca pea beans from the HSL stand at Seedy Sunday. 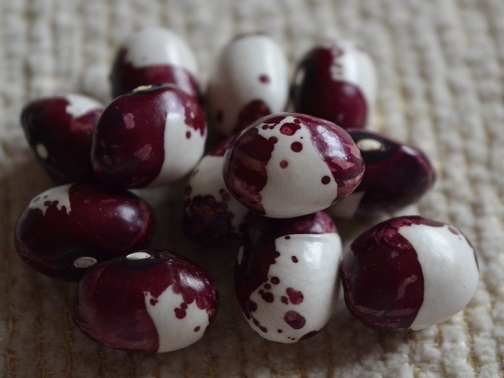 They are beautiful bi-colour beans, mostly with a clear line bisecting the bean along the middle. When I grew them they seemed to be half-runners, vining to about 4ft high with pink/lilac flowers and plain yellow pods when mature. Then I noticed a couple of the plants were very different – full climbers with many white flowers and mottled pods. 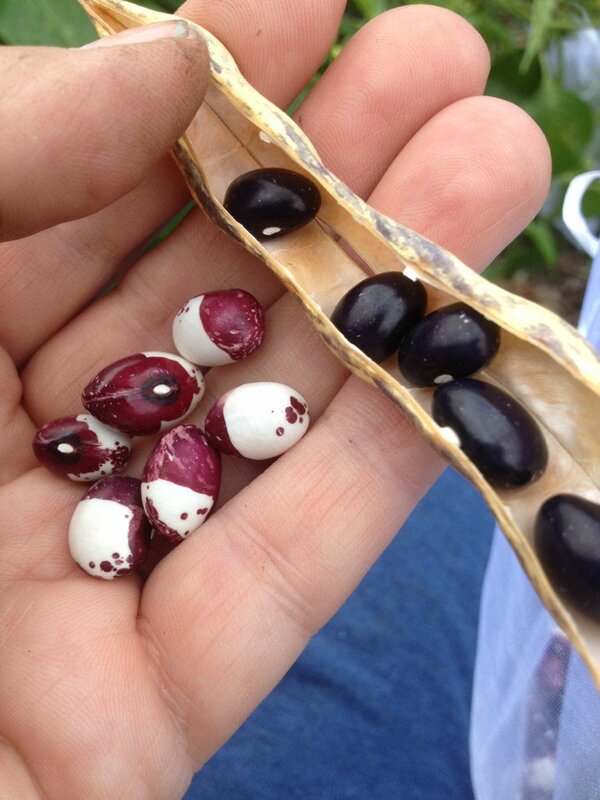 And the beans are jet black, sometimes with pale specks so the black pigment hasn’t totally overwhelmed the pea bean colouration. I haven’t grown anything there before, let alone beans, so I know they aren’t a remnant from a previous year’s crop. To further confuddle me, I was sent another pack of Inca pea bean seeds, this time from the virtual seed parcel on the Grapevine. And these are different again, a dark reddy-brown bi-colour with the occasional spot or two (see pic left). The seeds are from 2014 which might explain why they are so dark. So would the real Inca Pea Bean please stand up? Or could there be two strains? After a (lengthy) trawl of the internet I think there might be at least two – one that is the orca-like one that is in the VSP (above left) and comes in both red and black colours, and the one I have from HSL (right), which seems to be on some of the German bean saving sites. *The beans in the photo at the top are L-R: Inca pea bean (F2 cross/rogue), HSL Inca pea bean, VSP Inca pea bean and, to add some more confusion/comparison, some fresh Monachelle di Trevio beans, which might (or might not) darken more with age. This is why whenever possible,I mention my source of my seeds. Makes it possible to spot where a mistake might have originated. 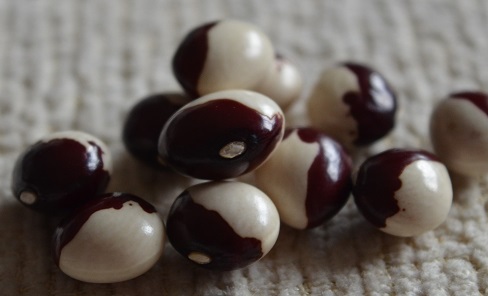 If the black and white bean is stable, it is probably a mislabelled packet. For what it’s worth, my Pea Bean Inca look like the HSL one, but did not come from HSL. My plants were taller than 4ft though. Your black-seeded cross may not stay black-seeded. In the next generation, the F2 generation, you should see a myriad of differences, perhaps including the black type you like, and maybe not. Great fun. Thanks Petra. And thanks to some very patient people over on the GYO forum I now know that both came from HSL originally. On (much) internet trawling and info from Nellie who grew the VSP strain, pea bean seems to be a gardeners’ term for a group of similar beans rather than a recognised subclass of Phaseolus vulgaris/climbing beans. So mine might be a different strain of the same thing, if open pollinated beans will still cross (and they do if my F2 is anything to go by). Perhaps the VSP version should have just been pea bean, not pea bean Inca but both markings come up on internet searches for Inca. Interestingly my version also looks like Aunt Jean’s, though it has 5-6 beans per pod not 3. My head is starting to hurt….! The F2 might go weird next generation (or after) but I am keen to see what happens. After all, it’s not like chillies or squashes where the crossed fruit could be useless. I have some space to tuck it away in so it won’t cross with others.